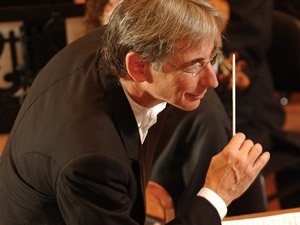 Series curator and conductor Michael Tilson Thomas will lead members of the San Francisco Symphony , along with conductor Donato Cabrera and others, in a program dominated by three Californian composers. The eccentric evening includes the wildly inventive Harry Partch’s Daphne of the Dunes and Lou Harrison’s joyously cacaphonous Concerto for Organ and Percussion Orchestra, as well as the New York premiere of contemporary composer Mason Bates’s Mass Transmission. If you have the chorus as this kind of animal warmth of human emotions as seen through the eyes of these children who are speaking with their parents, and if on the other end of the spectrum you have this kind of mechanistic world of tecnology and the static that the electronics are going to inhabit, I like the idea of the organist being this kind of omniscient figure operating between those two things. The program also features composer David Del Tredici’s Syzygy. For more information on this concert, visit the event page at Carnegie Hall’s web site. For an excellent overview of the American Mavericks series, including the “Introducing the Mavericks” blog series, visit here.